Think a great home page is all you need to increase visibility and drive more sales? Maybe it’s the ideal product page that will boost your business to the next level? Think again. 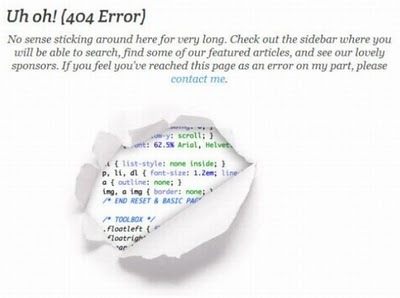 The most underrated page on your, and any, website is…drum roll please…the 404 Error page. Call me crazy, but everyone knows how frustrating it is to try to navigate someone’s website only to get trapped on the same old error page. “You appear to be looking for a page that does not exist (You idiot)”. It causes nightmares, it causes panic, and sometimes, it causes you to leave the site. If your business relies on your website to drive traffic and sales, you cannot afford to lose potential business because of a 404 Error. Regardless of how careful you are, how simple your site is, and how smart your consumers may be, people will still land on this page. But you can change the nature of the experience simply by paying attention to how that page looks and behaves. Make it more personal. Instead of boring, technical speak, why not craft something with a little bit of compassion, or even humor? The visitor will feel a little less detached, and is more likely to stick it out on the site. Highlight contact information. Either I made a mistake, or the website made a mistake. And the best way to solve the problem is to get in touch with a human being on the other end who can walk me through this. Call out the most important pages on your site. Link to highly trafficked areas so that the potential customer does not have a hard time “starting over”. A more advanced option is to write a script (or potentially find one online) that looks at the incorrect URL and guesses where the visitor was trying to go. This provides them with a Google-like “Did you mean ____?” experience. Don’t get me wrong, the 404 page is not the one most responsible for your lack of business. But it is the one page that most often goes unchanged or ignored for years at a time.